The Mill Creek Building, on the first block to be developed by J.C. Nichols for his Country Club Plaza in 1923, was designed to echo features of older California buildings. The block between Mill Creek Parkway and Wyandotte from 47th to W. 46th Terrace was meant to serve the residents of the new neighborhoods being filled in south of Brush Creek. A recent photo of the block taken from the east. J.C. Nichols, certainly one of the most important residential developers in Kansas City, started developing this block of the Country Club Plaza in 1922. Nichols had been building residential neighborhoods to the south of Brush Creek since 1907, and he saw the need for an area to provide goods and services for the new residents of southern Kansas City. 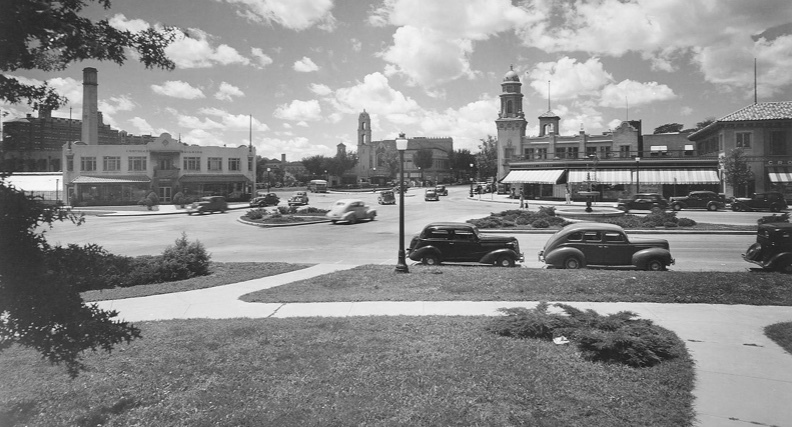 Nichols also had an important insight – that the area he envisioned as the Country Club Plaza shopping district would be accessed not by streetcar riders, but by people in cars. This block – from Mill Creek Parkway and Wyandotte from 47th to W. 46th Terrace (then called Kraukhoff Court) – was the first part of the new shopping district to be built. It maintains much of the same character as it did almost a century ago, in part because Nichols put a great deal of thought into the design and architectural detail of the early Plaza buildings. Many Kansas Citians today have probably walked down the block without stopping to observe it closely. As part of our Uncovering History Project, the Midtown KC Post is taking a look at each block in Midtown, including a set of 1940 tax assessment photos which is available for many blocks. (Many people seem confused by the tax assessment photos, which all include a man holding a sign. Here’s the story behind them). Today, the block bounded by Mill Creek Parkway and Wyandotte from 47th to W. 46th Terrace. 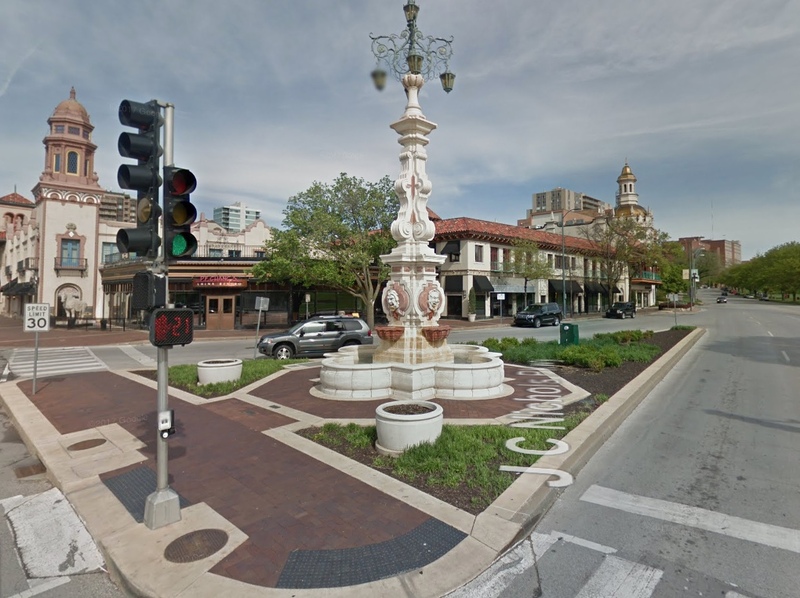 Before J.C. Nichols, most people considered the area that would become the Plaza as not worthy of development. Brush Creek ran through it, leaving the ground swampy, and attracting undesirable businesses. There were rabbit farms, a brick kiln, and just south at the site of today’s Plaza Library was a farm that raised goats and Belgium hares. Across 47th Street, Chandler’s nursery with its large smokestack stood. 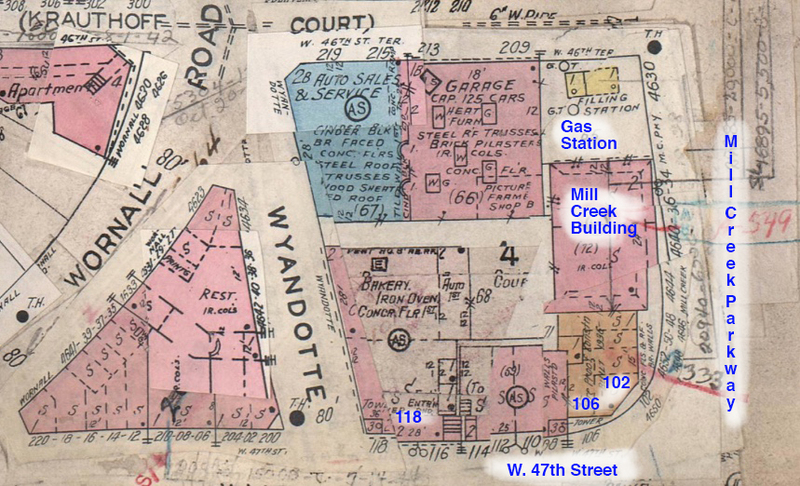 A Sanborn fire insurance map of the block from 1909-1950. In 1922, despite critics who termed it “Nichol’s Folly,” the developer shared plans for an “outlying business center,” designed around the demands of auto traffic, to cost $5 million. The Nichols Company said all of the buildings of the Plaza would be “in architectural harmony.” The Kansas City Star reported on April 30, 1922 that architects and realtors across the country were watching to see what happened, especially as the first shops were constructed in 1923. The Mill Creek Building on Mill Creek Parkway was designed by Edward Buehler Delk, who wanted to echo the charm of older California Buildings. He incorporated Spanish tiles in apricot and red tones as well as California tiles. The building also has horizontal bands of terra cotta tile. 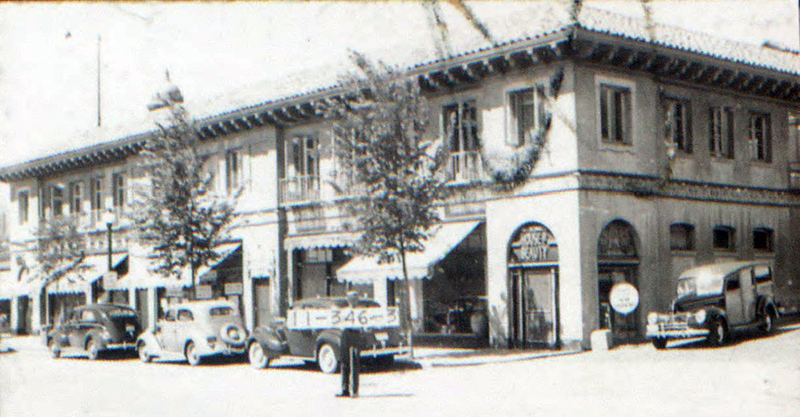 “Casting a modern mercantile building in the garb of the early Spanish Renaissance, the Fred Wolferman Company is the largest concern to demonstrate a building may answer all the 1924 extractions as to sanitation and service and still be very attractive to the eye.” The store’s interior was finished in gray and ivory with touches of orange and black. Its vestibule was lined with refrigerated windows lined with glass and tile. Along 46th Street Terrace (then known as Kraukhoff Court), the Nichols Company catered to automobile needs. At the Mill Creek corner, drivers could gas up their cars at a Spanish-style service station. Next door, architect William Tanner designed a garage in 1924, originally occupied by the Barker-Hurley Motor Company, which sold Fords. The block, seen from the east, in 1945. The building with the smokestack was Chandler’s Nursery. Over the decades, many businesses moved in and out of the block. Wolferman’s was replaced by a bank in the 1960s. Hat and fur shops came and went on 47th Street. Robinsons Shoes operate on the block from 1928 to 1976. Replacing the gas station, the popular Alice Wong’s Pacific Café moved in at Mill Creek and 46th Terrace, where the popular Figlio Restaurant was later located in the late 1980s. The slideshow below shows the rest of the buildings on the block as they appeared in 1940.